A major medical breakthrough - scientists in Israeli have printed a 3D heart. And despite its small size, this technology could potentially be used to fight the number one leading cause of death for American men and women, and that’s heart disease. 3D hearts have been printed in the past, but they were simple tissues and didn’t contain blood vessels. And hearts need blood vessels in order to live and function. So that’s what really makes this technology different. 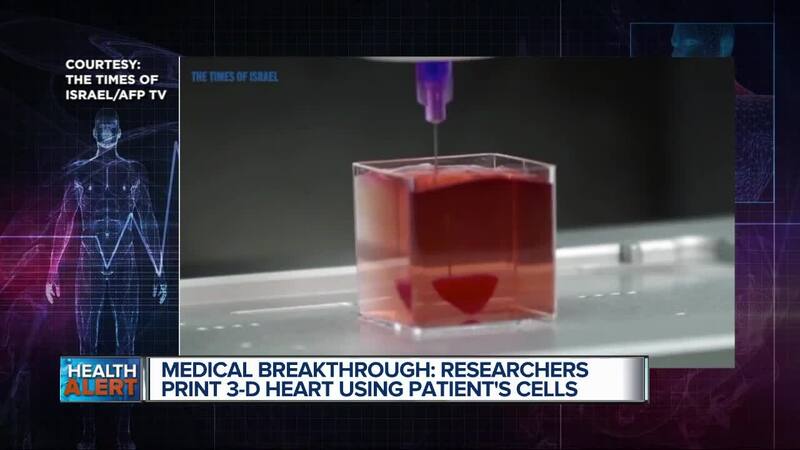 (WXYZ) — A major medical breakthrough - scientists in Israeli have printed a 3D heart. And despite its small size, this technology could potentially be used to fight the number one leading cause of death for American men and women, and that’s heart disease. 3D hearts have been printed in the past, but they were simple tissues and didn’t contain blood vessels. And hearts need blood vessels in order to live and function. So that’s what really makes this technology different. It’s now possible to 3D print an entire heart complete with cells, ventricles, chambers and blood vessels. Now the 3D-printed prototype is quite small measuring 2.5 centimeters. So it’s about the size of a rabbit’s heart. It took about 3 hours to print, and the researchers are estimating it would take about a day to print a human heart. So very fascinating stuff! The heart is made from human cells. What happened was the scientists took fatty tissue and separated it into cellular and non-cellular components. Then they “reprogrammed” cells to become stem cells. And these stem cells turned into heart cells. Now the 3D printer needs “ink”. And this ink is made up of patient-specific biological materials, they’re substances made of sugars and proteins that are turned into a gel. And using the patient’s biological materials is very important because this reduces the chance the body will reject the organ. It’s possible that full-transplants might happen down the road. However its more likely that this technology would be used to patched diseased hearts. But we’re really getting ahead of ourselves. First the researchers need to develop the printed heart further. Right now the heart cells contract, but they still need to synchronize and form a pumping ability. And if that happens, then tests with animal models would likely be the next step. But let’s not rely on technology to save us. Reduce your risk of heart disease by not using tobacco, eating a heart-healthy diet, maintaining a healthy weight and exercising 30 minutes most days of the week.